STIHL Outdoor Power Equipment Out of the Box! STIHL outdoor power equipment is used by ‘Real People’ and many are passed down from generation to generation, that’s how tough a STIHL is. Check out this video on why Kay Kamish is one of many ‘STIHL People’. STIHL has been making chainsaws in one form or another for over 80 years. AND STIHL is the only gasoline-powered chainsaw on the planet that designs and manufactures its own chainsaws. 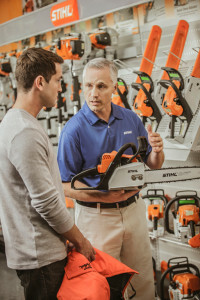 STIHL can NOT be bought at big box stores, all STIHL products are sold through a network of servicing power equipment retailers throughout the country. That makes buying a STIHL product more personal and gives the buyer more power. 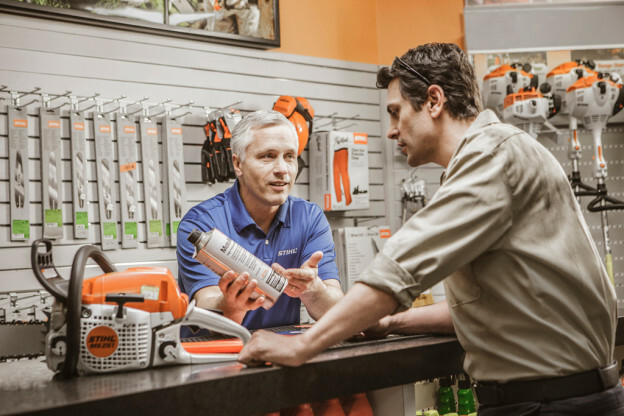 They can test out the equipment before they buy, ask questions in order to get the right STIHL product for the job AND have a place to get their STIHL product serviced throughout its lifetime. Anyone who has ever bought their outdoor power equipment from a big box store can tell you that when they have a problem or need service, they are out of luck. This can be frustrating and leave them with a bad impression of the brand they bought. STIHL is not only serious about their outdoor power equipment, they are serious about their reputation management … THAT folks is why you can’t buy STIHL products at a BOX STORE!! **All units are set up and inspected by factory authorized technicians. We register all warranty information and will assist you in loading your equipment into your vehicles at no extra charge. This entry was posted in Commercial Lawn Equipment, Outdoor Power Equipment, STIHL Outdoor Power Equipment and tagged STIHL Chainsaw, STIHL Chainsaw Reviews, STIHL Dealer, STIHL Dealer Delaware, stihl outdoor power equipment, STIHL products, Why buy a STIHL on August 12, 2015 by Suburban.